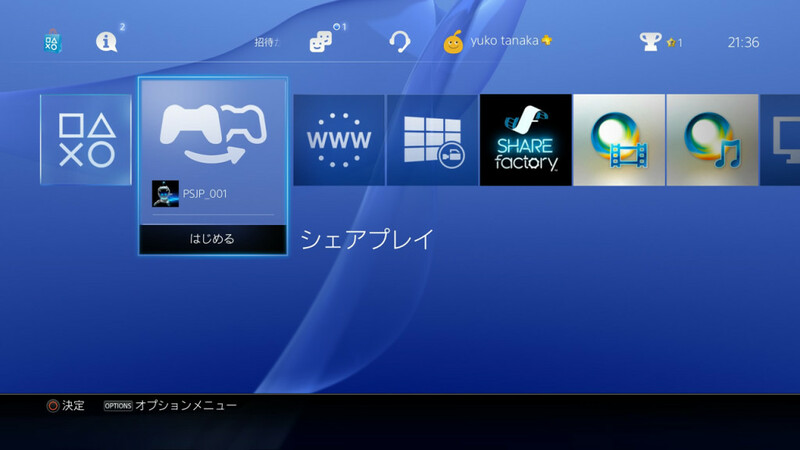 PS4 2.0 Update – Release Date Revealed! Yes, less than a week until we can all enjoy the additional (yet some late) features coming our way. I was actually expecting a mid-November release due to the original statement of “we don’t want you guys playing some of the biggest games of the year without the biggest update of the year”. I thought this statement was to imply that the functionality of Far Cry 4, being given to give 10 keys (of 2 hours each) to your friends, would require the Share Play feature and we won’t see it until November 18th. Plus the fact that it’s only just been properly explained and Sony still has plenty of time to hit the end-of-year deadline. To find out just what will be included and what benefits you will receive in the next system update click here. For further information, see below. One thing that has been brought more attention recently is the Share Play experience and what exactly it allows you to do. 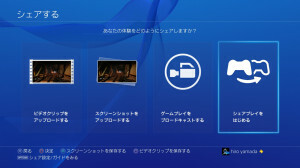 Sony Computer Entertainment Japan and Asia sent a press release further explaining how the Share Play functionality will work. Let’s be honest, this is what we are most looking forward to J. Display host’s game screen for visitor: the host has control of the game. Visitor plays instead of the host: the visitor has control of the game. For this particular mode only the host needs to have a PlayStation Plus subscription active. Host and visitor play together: both host and visitor can control the game. Only for this particular mode both host and visitor need to have a PlayStation Plus subscription active. 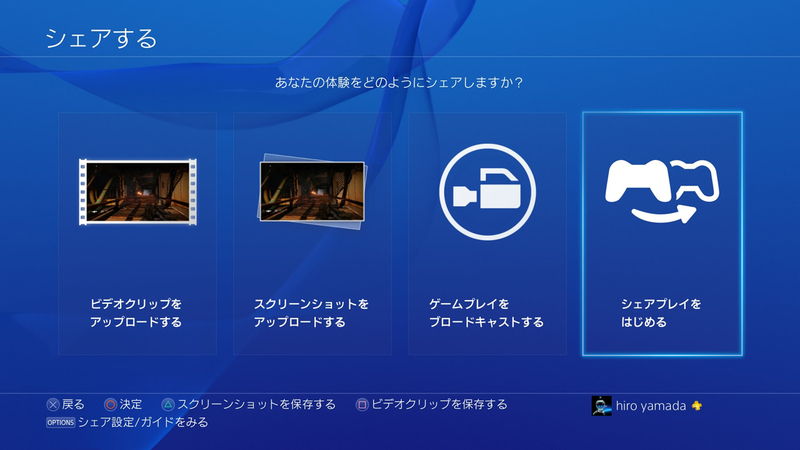 The visitor will automatically log out from the PlayStation 4 of the host at the end of the Share Play. This does bring up my dislike with the horrible lack of rear USB socket and only two like the PS3. Thumbs up to Microsoft for including a third USB socket, even if it is on the side of the console, which is better than nothing. The broadcaster can now display a simple message on the screen. Voices of others in the same party chat with the broadcaster can now be included in the Livestream. During the broadcast you’ll be able to use the voice controls of the PS4. A “Recommended” category will be added, including official broadcasts from Sony and those from friends and favorited broadcasters. You can favorite the broadcasters you like. You can exit a broadcast to operate the menus and still watch the video you left in a picture-in-picture mini-screen. You can watch archived broadcasts. Broadcasts can be filtered by language. The Twitch logo has been added. I am really looking forward to this release and it’s just around the corner. I’m sure system update 2.0 will make the experience of the PS4 so much better with added benefits of being more than just a games console. If you want to check out the latest news on Xbox One’s upcoming November update click here. This article was filed under Articles, Features, Gaming News, Playstation News, Software, Tech News. 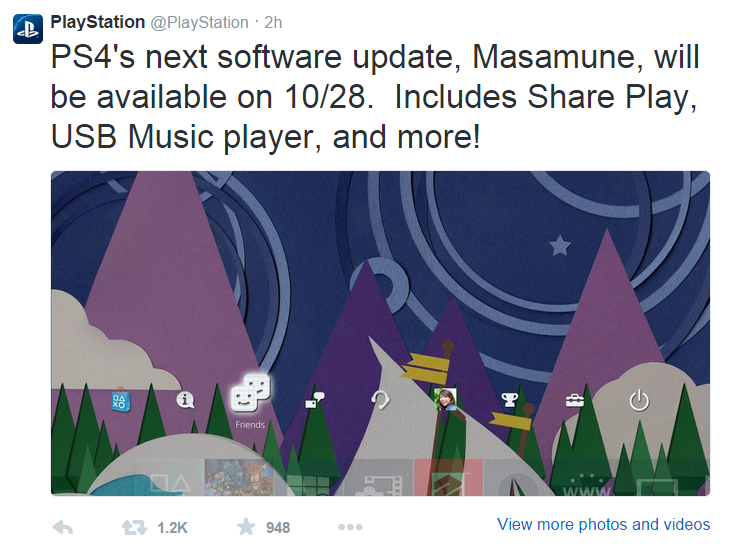 Tagged with 2.0, console, masamune, music, october, playstation 4, PS4, release date, share play, sony, update, usb.